I will share the New Line blogger template at this time. Prior to the new line, there are such features as I have shared before, Ideal opinion has been replaced with the opinion of the Discussion and publicly page navigation has been supported without posting restrictions. New Line is a beautiful design .it has responsive, light colors and many advertised features. This is very useful with tech or Business website. 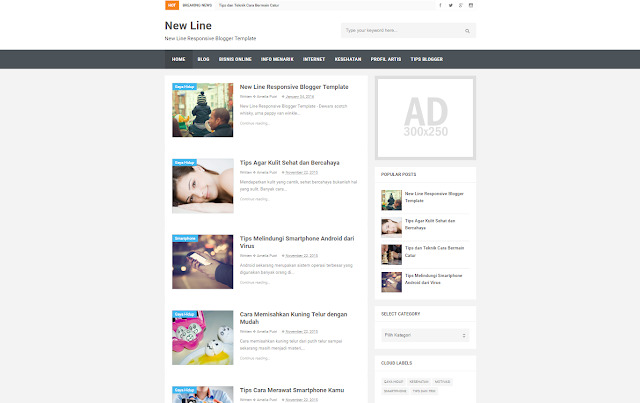 New Line Responsive blogspot theme, from with line and clean . it's extremely sensitive. The main color is white show pure. This is suitable for a news blog. At the top, breaks the news widget that pages can show. This created was the first year of 2016, its name was the new line 2016, Do not forget that are free, these are distributed in the premium version. There are many features which are great and supportive of these new commented and created, synchronized with unreleased comments, should be set without having problems. After the big project and my hard work. Download now this awesome premium theme and upload your website. And enjoy. But please don't forget to share my website.